Used to work to regulate the voltage at a power plant facility. Wields electricity, and possesses both quick wits and agile movement! ElecMan can be a tough customer so you should pick one side of his boss room and try to stick with it. Stay atop the Super Blocks and jump over ElecMan's Thunder Beams as he shoots them at you, making sure to take the opportunity for a strike when his back is turned. If ElecMan uses his Thunder Strike on you, make sure to run away to evade. 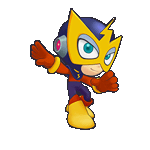 Just make sure you avoid ElecMan's quick attacks and jump over him he he gets to close and you should be able to wipe the floor with his narcissistic attitude.